Quite a long time ago since I posted on my blog. People around me know I had quite some issues past years with my wife’s health. She had a stroke in 2016 and things changed for our family. I had throttled down my job and quit as board member of VERON headquarters to take care of my wife and kids. After things quieted down, the hobby started calling me again. Band conditions gradually degraded in the past years as we enter a new sunspot minimum. Now I am a big fan of the 10m band. Reason for me to disassemble the 10m Moxon as the band is more or less closed throughout the year. I gained interest in the new 60 m band. A quiet band with nice properties regarding propagation and with quite less QRM from my neighbour’s solar panel installation than on 20m and 10m. But to have an efficient antenna for 60 m (56 m wavelength to be precisely) I had to increase the length of the vertical, preferably to quarter wavelength. A quarter of 56 m x shortening factor 0.96 = 13.5m. My next challenge was adding an extra 4.5m to the existing 9m. Disassembling the Moxon, which stood on the 8m high dormer’s roof, gave space to take the 9m (30ft) vertical and put it on the dormer. The dormer’s roof sits 2.1m (7ft) higher than the roof below where the vertical was mounted on a 2m steel mast with supporting base. While moving the antenna up I realized that the supporting steel mast, which is about 2m (7ft) long, could easily be a part of the radiator, adding an extra two meters to the entire electrical length. The mast that supports the 9m vertical is a galvanized steel mast about 2.0m tall, so this could be added to the physical length of the main vertical. Next step was to isolate the supporting mast from its steel base. I ordered four rubber vibration dampers as isolators which I mounted between mast and support base. Now I had 11m length, so still 2.5m left to add. The first section of the vertical is 30mm diameter aluminium. I found a piece of 36mm diameter aluminium tube about 1.2m length. I added this tube as the frist section increasing the total length of the vertical to 12.1m. Which left 1.4m extra length to be added to reach 13.5m. This turned out to be quite a challenge which asked for a temporary solution. What I did was relocating the CG-3000 auto tuner. I put it on top of another 2m long steel mast on the roof that sits below the dormer. 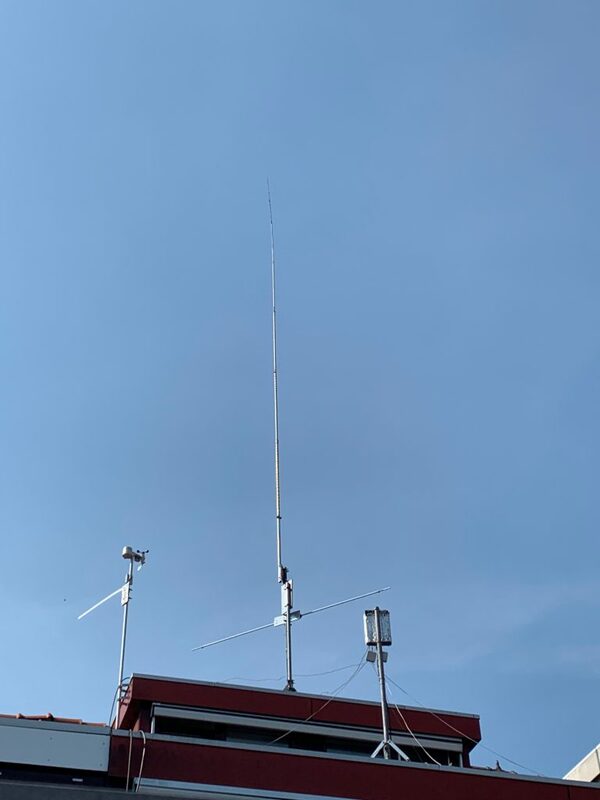 Then ran a wire 2m horizontally from the tuner and its connected radials to the steel mast of the vertical. However it’s not really adding to the electrical length in the right direction, vertical that is, it did allow me to tune on 160m, which the tuner would not do before. I presume that the electric length in creased anyway, but no cue how it would effect its efficiency. But testing it on 60m WSPR shows promising results. Next job is to add another section to the top section to replace the temporary solution, the horizontal wire. But everything on top of the 6mm carbon tube section, must be slim and not catch too much wind. So I am considering a 4mm carbon tube section or a 1.6mm stainless steel arc welding rod. However the last one catches a lot less wind, it may also bend. But that is something I will find out later. This entry was posted in Antenna by Jean-Paul Suijs - PA9X. Bookmark the permalink.